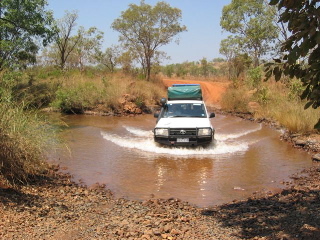 The picture shows one of the many creek crossings that we've done on the Gibb River Road. We started our trip in Derby. This particular crossing is on the way to Mornington Wildlife Sanctuary, after having turned right on the Gibb River Road. We were in the Kimberley in September 06. The temperatures were in the 40C's, so there's not a lot of water left in the creeks. Mornington Wildlife Sanctuary is "only" 90kms off the Gibb, but a heaven of peace and superb wildlife and nature!!! The trick to know on the Gibb River Road: in two weeks we did not have a single flat tire due to two key things: we lowered the pressure in our tires in Derby, just before getting on the Gibb Road, and we never drove above 90km/hr. I'm not 100% sure, but having met so many people stuck with 1, 2, sometimes 3 flat tires, and hearing how they drove, we believe we were not so bad in preventing it happening!! Hi Serge! I also think you did well. Having too much air in their tyres and driving too fast, that are exactly the reasons why people are forever busy changing tyres along that road!